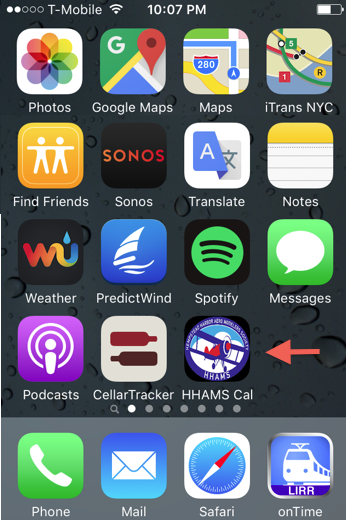 In my time between two jobs, I wrote a calendar app for HHAMS (Hempstead Harbor Aero Modelers Society). Or, at least, members see it as an “app”, since the calendar runs on smartphones, and can be set up as an icon on the home screen. It is really just a webpage served up by a Flask server. The calendar allows safety officers and members alike to organize field activities as they unfold today, or to plan activities ahead of time. It works on all smart phones as well as desktop PCs. 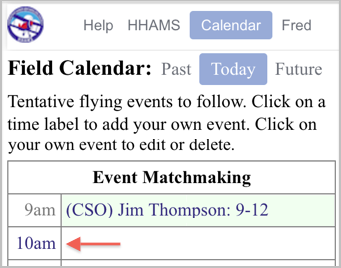 Information on the calendar is only visible to HHAMS members registered in the system. And only members can create entries on the calendar. 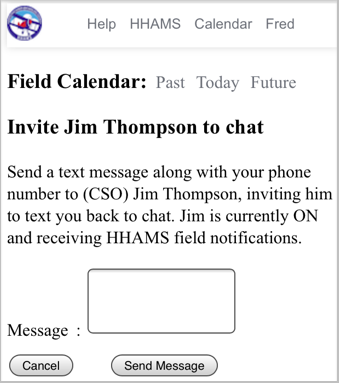 The calendar complements two existing communication systems in use: the Yahoo Groups mailing list for monthly newsletter and official communications, plus the field texting service used by safety officers to broadcast field open/close notifications. If the field texting service were free, and members were extremely tolerant of daily text spams to the whole club inquiring and making plans to meet at the field and to keep it open, we would have no need for an online Field Calendar. But field texting is expensive, and people in general hate spams… except when they are the ones sending these spams. 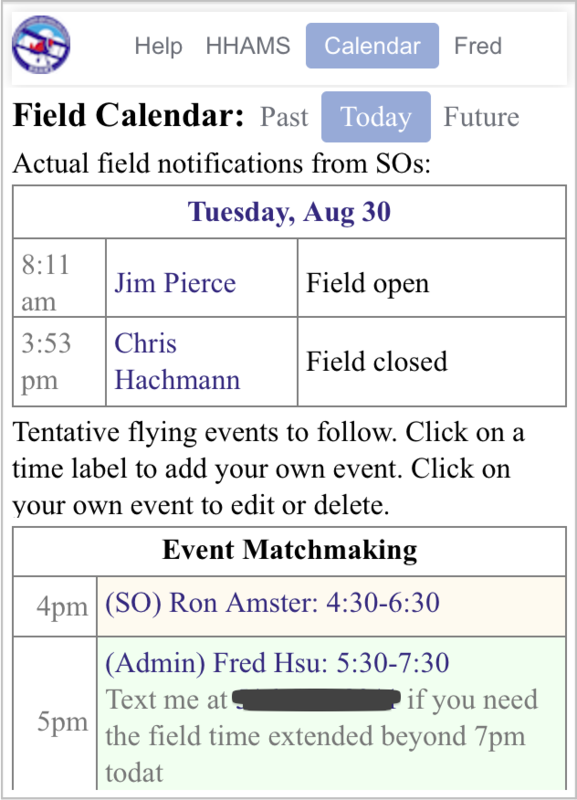 The main calendar page shows, at the top, official field open/close notifications posted by the Safety Officer In Charge (SOC) at the field. The rest of the page show flying hours and tentative entries created by members. Tap a blue hour number to create an entry indicating your flying time. Edit the event if necessary, and tap the “Save Changes” button to finish. You can invite any member to chat with you, even if you do not have their contact information. Don’t know whom to talk to? 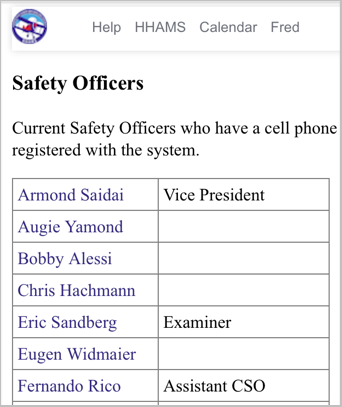 Look at the safety officer list, or the full roster. 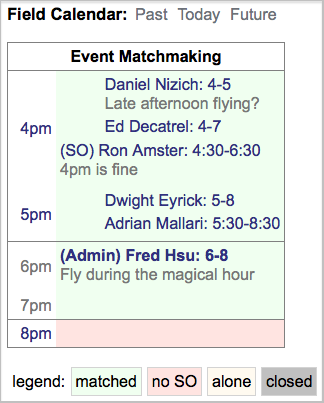 It is possible now to coordinate a group of people to fly at dusk. 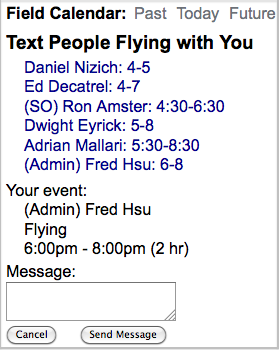 A participant in a group event can easily text everyone. Update 2016-10-06. The calendar learned a new trick. It now shows current weather conditions including wind speed and direction. It also show hourly forecast of wind condition and chance of precipitation for the next ten days on the calendar. Full user guide can be found at http://hhams.elasticbeanstalk.com/help/calendar. 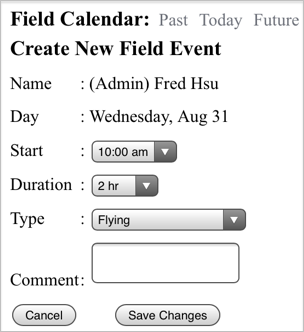 This entry was posted in HHAMS and tagged Android, Desktop PC, Field Calendar, Flask, Hempstead Harbor Aero Modelers Society, HHAMS, HHAMS Aerodrome, iPhone, Port Washington, Smartphone, SMS Messages, Texting. Bookmark the permalink.